Abedules s/n, 07560 Sa Coma, Spanje. Luxury hotel in Majorca. The Protur Sa Coma Playa is a big hotel complex, disposing of an unending number of services and facilities, in order to offer a relaxing and varied time in Majorca. It is located inside a 20000 m2 land full of gardens, very close to the splendid Sa Coma beach and the magnificent Cala Millor. In the Protur Sa Coma Playa Hotel you could enjoy different thematic restaurants, swimming pools, sauna, gymnasium and freely practice more than 20 sorts of different sports, such as tennis, paddle or mini golf. Its rooms are light and large, with wonderful views from the terrace toward the garden of the hotel pool. All of them dispose of the most modern equipments, such as satellite TV, direct phone, mini bar and full Bathroom. The Protur Sa Coma Playa Hotel is situated exactly in front of the Sa Punta de n´Amer natural park, where you can do beautiful trips and walks totally in the nature. 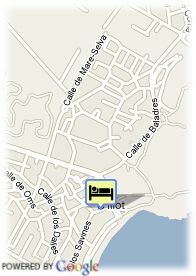 A complete hotel which try to satisfy all its guests' necessities in order to have an unforgettable time in Majorca. Notice: It disposes of no smoking rooms, on request.